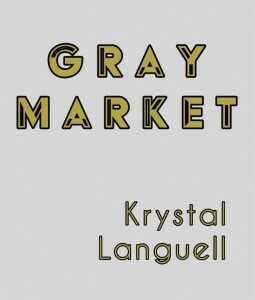 I’ll be reading at Berl’s, 141 Front Street, Brooklyn, NY on November 4th at 7pm along with Chia-lun Chang, Ariel Goldberg, Anselm Berrigan and Rachel Levitsky to celebrate Krystal Languell’s new collection, Gray Market (1913 Press). Seems like as soon as I get one newsletter issue done the previous one is posted online as a pdf file available for download. 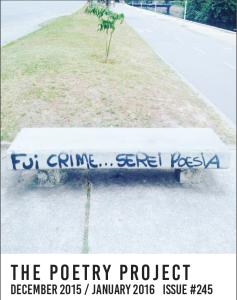 Included in issue #245: the usual awesome Poetry Project stuff plus poems from Krystal Languell, a photo essay from the Rio streets from Kaia Sand, a mini-interview with Pierre Joris and Jerome Rothenberg, a Gertrude Stein crossword puzzle & more! Beautiful letterpress broadsides for everyone!! Want one? Come to the reading on Friday! I think the image was meant to be a surprise, but the internets spoiled it. Amazing work by Sarah Nicholls. I can’t wait to get my hands on it. Organized by Marcella Durand and Krystal Languell on behalf of the Belladonna* Collaborative. 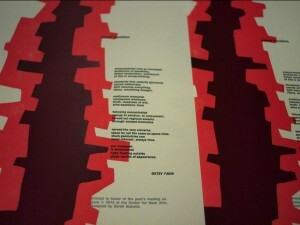 Subway: N/R to 28th St., or F to 23rd St.
Join us for the third broadsides reading of the spring! 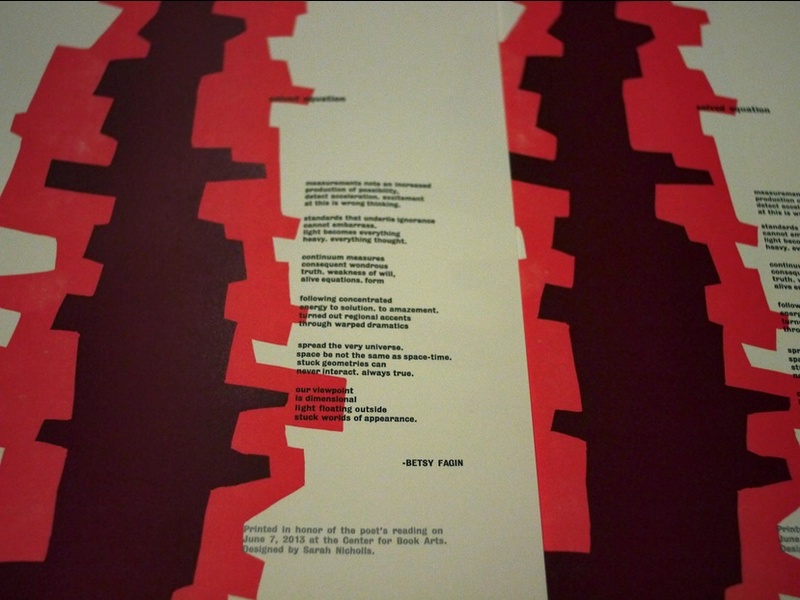 A reception follows the reading, and guests receive free broadsides. Born in the Mekong Delta and raised in the Washington, D.C. area, Hoa Nguyen studied Poetics at New College of California in San Francisco. With the poet Dale Smith, Nguyen founded Skanky Possum, a poetry journal and book imprint in Austin, TX where they lived for 14 years. The author of eight books and chapbooks, she currently lives in Toronto Ontario where she teaches poetics in a private workshop and at Ryerson University. Wave Books published her third full-length collection of poems, As Long As Trees Last, in September 2012. Betsy Fagin is an activist, poet and librarian who explores the territory where art, information access and political engagement through direct action meet. She received degrees in literature and creative writing from Vassar College and Brooklyn College and completed her MLS degree in Information Studies at the University of Maryland where she was an ALA Spectrum Scholar. She is the author of Poverty Rush (Three Sad Tigers, 2011), the science seemed so solid (dusie kollektiv, 2011), Belief Opportunity (Big Game Books Tinyside, 2008), Rosemary Stretch (dusie e/chap, 2006) and For every solution there is a problem (Open 24 Hours, 2003). She is currently a Lower Manhattan Cultural Council Writer-in-Residence. The Center for Book Arts is committed to exploring and cultivating contemporary aesthetic interpretations of the book as an art object, while invigorating traditional artistic practices of the art of the book. The Center seeks to facilitate communication between the book arts community and the larger spheres of contemporary art and literature through exhibitions, classes, public programming, literary presentations, opportunities for artists and writers, publications, and collecting. Founded in 1974, the Center for Book Arts was the first organization of its kind in the nation.